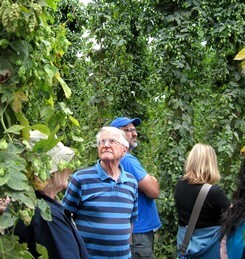 On 31 August 2014, Slow Food Corvallis visited the Rogue Hop Farm, a 42-acre site beside the Willamette River near Independence. Here the Oregon brewing company grows and processes much of the hops used in its popular beers and ales. About forty of us gathered in the field to begin the tour. In a section of towering bines that hadn’t yet been harvested, we examined the tall trellises and sniffed the fragrant cones. Our guide, Andrea, next led us to the entrance of the Picker, where the bines are unloaded from trucks, strung up on hooks, and carried by machine into the building. Inside, the hop cones are separated from the bines and borne on a belt toward the kiln. We followed their course to the upper floor of the kiln, where the cones are spread and heated until they are dry, and down to the lower floor, where the cones are pressed into bales to be trucked off and made into pellets. After a question-and-answer session beside a mountain of hop cones, we meandered over to the on-farm pub and queued up for our free taste of the day’s brew. Many of us also ordered a tasting tray, with six beers of our choice. Then we sat on the grass in the farm’s old home orchard to listen to a talk by Dr. Alfred Haunold, who told us stories from his 35 years as leader of the USDA hop breeding program at Oregon State University. Often called the Hopmeister, Al headed the team that developed many of the hop varieties most in demand worldwide today, including the aromatic types favored by small breweries and one special variety, Teamaker, that is nearly entirely free of bitterness.